Wow, that brings back a lot of memories...and thanks for posting the movie I made with my friends of the implosion of the Durham Hotel. 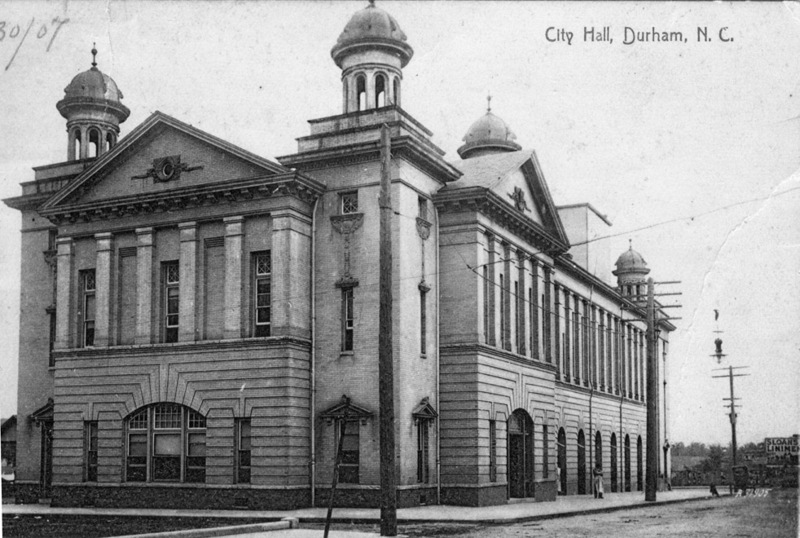 But seeing all the other images really took me back...I lived in Durham for most of my life, and grew up there. The photo of the crosswalk that led to the rooftop pool really reminded me...my high school boyfriend's mom worked at the hotel and we used to go swimming in that pool a lot, plus also hang out at the hotel. It was really really sad to witness and film its implosion...and people were standing around long-faced, some crying. And for WHAT? A friggin' PARKING LOT? Why? Of course watching the film I made with my friends always makes me sad...but seeing those other photos here brings it back even more, and reminds me of the beauty of the place. Some of those photos I have never seen. In the third picture down--of Rotary Park... is that the gazebo that got relocated to Bennett Place. Looks exactly like it. That sounds very, very familiar - I'm trying to remember if the monument is from the 1920s as well, which would fit the overall timing of 'improvements' at Bennett Place / placement of gazebo. I glanced at a few books to try to confirm this, but didn't see it. I'll keep looking. I finally did confirm this, and have changed the post to reflect that info. Thank you for jogging my memory about this! You mentioned that the owners tried to give away the hotel. What you didn't mention is that one prospective donee was Duke. Terry Sanford was President and Ken Pye was Chancellor, and they turned it down for reasons best known to themselves. Duke was bursting at the seams because of the need for dormitory space. Anyway, after the main hotel was torn down, what did Duke do? Why it PAID to rent the motel to house an overflow of graduate students. A good friend of mine was a law student at the time. Oh, but it gets better. Terry Sanford got concerned about the state of downtown Durham and helped organize a committee to spur "revitalization." The committee helped the city hire a consultant, and the consultant came back with a great recommendation: Build a "civic center" with, oh yes, a hotel. That's how we got the Marriott, originally the Omni. Thanks John, I didn't know this. It's a good reminder that Duke's actions have always been inscrutable. I have yet to fully understand why they sold off Four Acres, which had been an alumni reception building and a museum of sorts for Duke family memorabilia. But all one can conclude is that Duke's attitude towards downtown has always included a bit of nose pinching, and when things really got crappy, it was politically expedient to pay lip service to downtown while bunkering back in the pine trees west o' town. Hey Gary...Just a heads up for you....The Washington Duke Hotel is now called The Washington Duke Inn AND GOLF CLUB. I kind of like being "bunkered back in the pine trees west 'o town". Very difficult to play golf from a 16 story hi-rise bldg. I lived in Durham as a child - roughly speaking, the first 10 years of my life - more or less corresponding to the 60s. Obviously, a child has a special relationship with the place where he or she lives; and though I didn't do all my growing-up in Durham, that first decade of life is unique in its significance. So lately, via Internet and Google, I decided to re-visit my childhood home town. 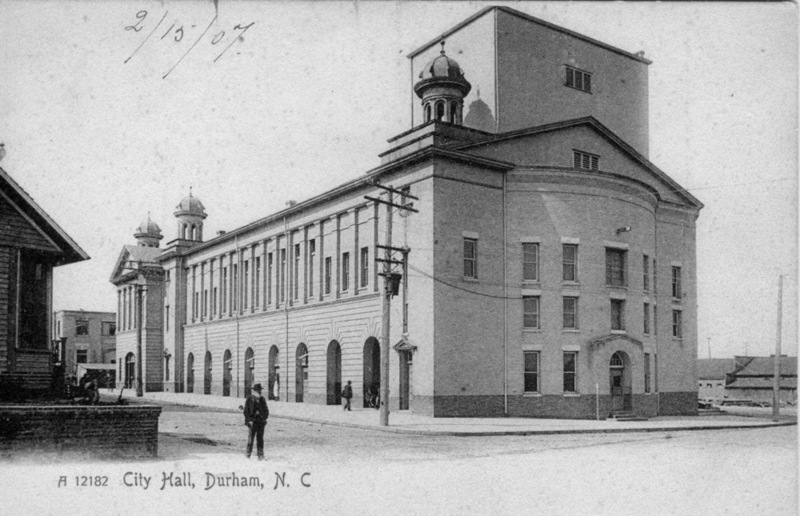 In those days I was a devoted citizen of Durham and a proud Tarheel. I remember how annoyed I got when I was away on trips with my parents and we ran into people who seemed to think that Durham was a town in ... England. Outrageous! How could they not know that Durham NC was MUCH larger and MUCH more important...? Now I have lived in England for 30 years, and I have been through the lovely town of Durham numerous times, and I guess that when I hear "Durham", well, yes, nowadays I think of the northern cathedral city near Newcastle. Which right now feels like a terrible admission of disloyalty. Anyhow, as a boy, back in lovely Durham NC, I was crazy about tall buildings. Every day I hoped Durham would set about erecting a whole bunch of exciting skyscrapers as a matter of urgency. But, er, that didn't happen. And I see on Google that it hasn't happened in the intervening 40 years either. At any rate, I had to make do with the CCB building and the Jack Tar hotel. And they were worth a lot. The two of them were impressive, elegant buildings which made me think of New York - Metropolis - Superman - Dragnet (the CCB building, I thought, resembled the Los Angeles City Hall, or the tall building which Superman was able to leap over in a single bound). Walking past the CCB building you could look up and pretend you were in Manhattan. Though I was perfectly happy to be in Durham and didn't adopt my parents' view that New York was the centre of the world and capital of civilisation. Walking into the Jack Tar Hotel, I felt I was entering one of the grand New York or Washington hotels where we used to meet relatives visiting from Europe. So imagine my shock when I simply couldn't see the form of the Jack Tar Hotel in present-day images of Durham. There is the CCB building, still the mightiest skyscraper in town - and next to it - air, nothing. Well, now - thanks to this utterly brilliant blog - I know what happened. And there are no adequate words, you're right, for the idiotic and scandalous destruction of such a great building. OF COURSE it could have been converted into student housing. And placing a population of students in the middle of downtown Durham might not have been such a bad thing. And by now, maybe, it might have been converted yet again into fancy apartments. Or back into a hotel. But instead, no, it was demolished, flattened, razed to the ground. I can only say that your wonderful blog with the fantastic images and the fascinating, learned text does a very fine job of paying tribute to this fine building. 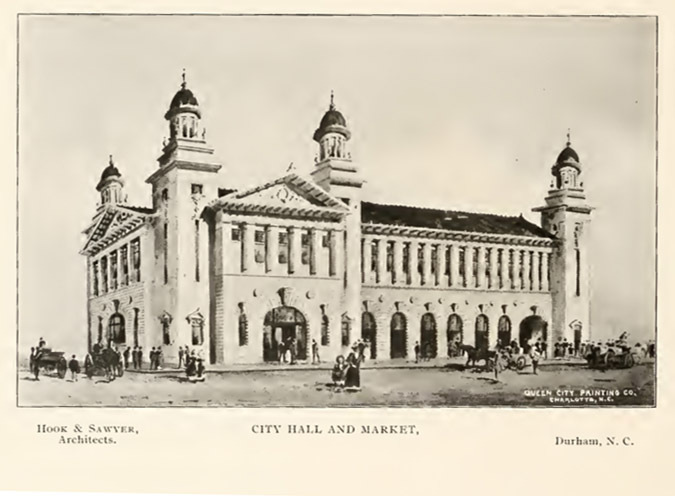 (In particular, it is a great revelation to be reminded just how elegant the building once was before the exterior street frontage of the lower floors was bricked up.) Many thanks. 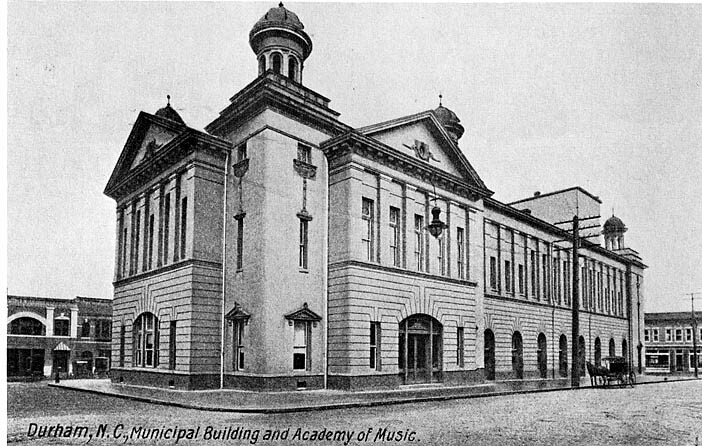 "The Academy played a major role in providing entertainment for the people of the community. Dramatic plays and musical comedies were regular attractions, and for a number of years, the theatrical season was opened by the appearance of Al G. Fields Minstrel. May concerts by prominent singers of the day were presented by the Durham Kiwanis Club and other organizations, and local talent shows attracted capacity audiences. 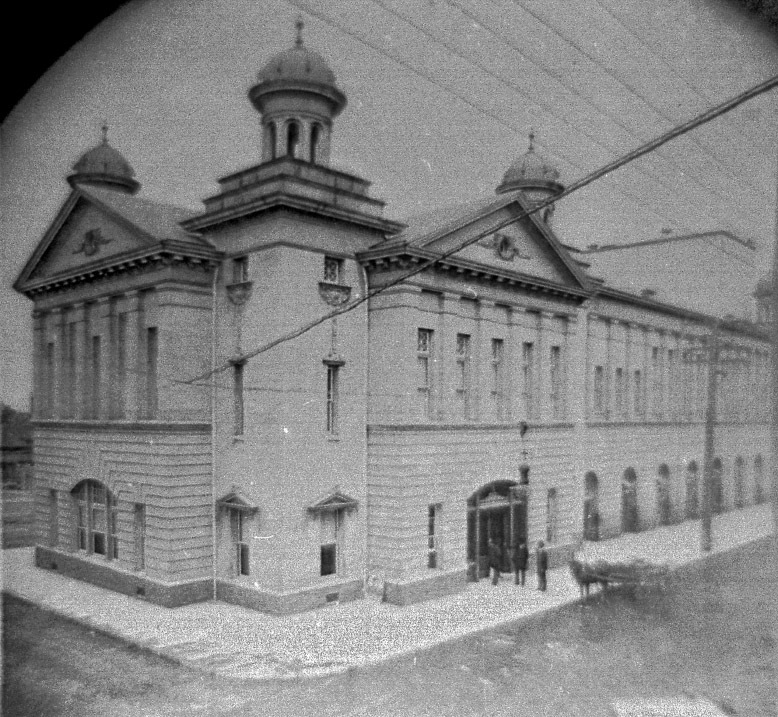 Public meetings in the promotion of the city's interest also made use of the building a for a number of years the Elks' annual memorial services were held there." As previously noted in the post for the Washington Duke Motel, the owners had attempted to keep up with the motel era by demolishing the buildings across Corcoran St. to build a motel structure with a rooftop pool. It was connected to the older hotel via a skybridge across Corcoran. "I spent many an afternoon roaming around the halls in the early '70's. I can remember staying there in the '60's when you could pull into the parking deck across the street and register via closed-circuit TV. Pretty cool for 1968!"